Our database has 3260 letters sets to date. 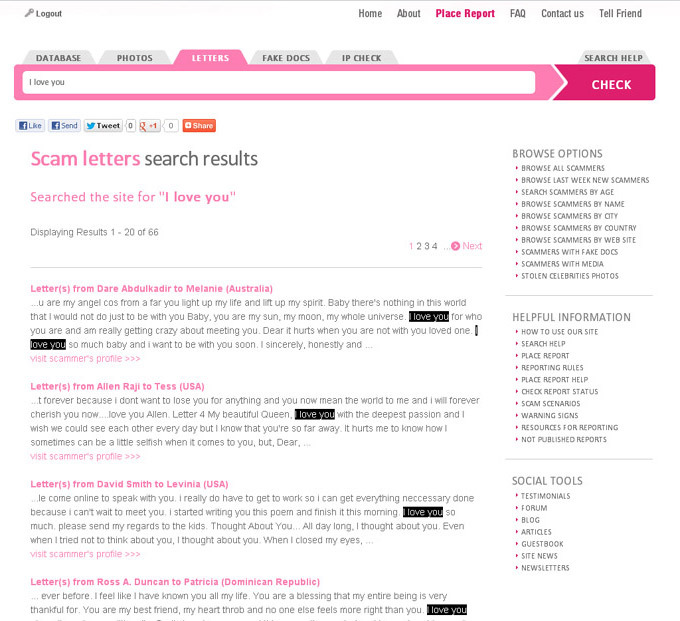 It is the largest collection of letters on the internet that are commonly used by scammers. This is a very helpful tool to check any questionable letters you have received from men on dating sites or other from unknown sources. Understand, most scammers use the same pre-written letters over and over again. They change the photos, names, email addresses, and other information. Rarely do they write anything original or personal. You must find out if you are being targeted by a scammer. If you discover the exact same letter in our database, guess what! You are being targeted by a scammer! You need to know this stuff and our database can help protect you! "Hi. My name is John. I'm new on this dating site. I don't have a lot of time to chat, but I want to find my unique woman!!! I would like to meet you face to face. I know you are online now and can read my message. I ask you, please, please, please find time to write me at my E-mail. Or give me your e-mail address, please. OK? So I can write you back. I will be waiting to hear from you. Your letter will be important for me." Just copy and paste any phrase (for example: "I would like to meet you face to face"), and then search. The results will show all the scammers that have written letters with the exact same phrase to women in the past! If the phrase did not match any letters in our database, try searching with a different phrase(s) or phrase(s) from another letter. It's highly recommended you choose phrases from the first few letters you received. They are usually very general and not personal at all!